The Grotto vent cluster contains an assemblage of black smoker vents that lie within the Main Endeavour Field on the northern Juan de Fuca ridge (Bemis, 2001; Rona and others, 2001, 2010a; Bobbitt, 2007) (figure 4). New imagery of submarine plume behavior and properties was achieved with a new acoustic system that extends underwater observational distances beyond those of light to image buoyant plumes of submarine black smokers in 3-dimensions and image areas of diffuse flow seeping from the sea floor in 2-dimensions (Rona, 2011; Rona and others, 2010a, 2010b, and 2011). Figure 4. Map of Main Endeavour Field, Juan de Fuca Ridge (grid system in meters), showing the location of the Grotto Vent at grid coordinates of about 6115 and 4920. Note scale-the entire Endeavour Field is only ~400 m long. According to Merle (2006) Grotto vent resides at 47.95°N latitude, 129.10°W longitude, and at a depth of ~2,196 m.
The Cabled Observatory Vent Imaging Sonar (COVIS) was installed in September 2010 (Light, 2011). Operations were initiated with in situ sensors in the NEPTUNE (North-East Pacific Time-Series Underwater Networked Experiments) Canada Program cabled observatory on the Main Endeavour Field (MEF) of the Juan de Fuca Ridge, nearly 370 km (200 nautical miles) off British Columbia, Canada, in the NE Pacific Ocean (figures 5 and 6). NEPTUNE is a Canadian research facility designed for regional-scale underwater ocean investigations focusing on continuous monitoring of temperature, chemistry, biodiversity, and motion. This data will be broadcast via the Internet for scientists, students, educators and the public to collaborate and promote investigations into: underwater volcanic processes; earthquakes and tsunamis; minerals, metals, and hydrocarbons; ocean-atmosphere interactions; climate change; greenhouse gas cycling in the ocean; marine ecosystems; long-term changes in ocean productivity; marine mammals; fish stocks; pollution and toxic blooms. The public can gain a more in-depth understanding of the seafloor, while ocean scientists can run deep-water experiments from labs and universities anywhere around the world. Figure 5. Map of NEPTUNE Canada Program's six submarine sites with multiple sensors connected to a high-speed optical cable linked with University of Victoria in British Columbia, Canada. The Main Endeavour Field, labeled as Endeavor (in red), one of the instrumented sites, is ~350 km WSW from Port Alberni. Over the project's 25-year lifespan, Endeavor will collect data for underwater volcanic processes, seismicity, plate tectonics, hydrothermal vent systems, and deep sea ecosystems. Courtesy of NEPTUNE Canada (2011). During a research cruise in September-October 2010, scientists from the University of Washington and Rutgers University connected COVIS to the NEPTUNE Canada cable system for the first time and initiated data acquisition on 29 September 2010. COVIS, equipped with a customized multibeam sonar, 400/200 kHz projectors, and a rotator system to orient acoustic transducers, was positioned to acquire acoustic data from a fixed site on the floor of the ridge's axial valley at a range of tens of meters from the Grotto vent cluster in the MEF (figure 6). Figure 6. COVIS acoustic image, oriented NE on the left to NW on the right, made at 0600 UTC on 11 October 2010, looking S at black smoker plumes and areas of diffuse flow draped over bathymetry of the Grotto vent cluster (Jackson and others, 2003) in the Main Endeavour Field, Juan de Fuca Ridge. The image was made when tidal currents were minimal (e.g., near slack tide). The larger plume is from the N tower edifice at the NW end, and the smaller plumes are from the NE end of Grotto vent at the in-situ experiments. The legend (at the upper left) specifies isosurfaces of plume volume scattering strengths (in decibels per meter) related to particle content and temperature-density discontinuities. The vertical color bar (at the far right) gives normalized decorrelation of backscatter (0-1) due to diffuse flow from the sea floor at 0.8-sec lag. The plumes decrease in acoustic backscatter intensity as they mix with surrounding seawater with height (in meters) above vents. From Rona (2011). The purpose of the COVIS experiment was to acoustically image, quantify, and monitor seafloor hydrothermal flow on time scales of hours (response to ocean tides) to weeks-months-years (response to volcanic and tectonic events); this advances our understanding of these interrelated processes. According to Rona and others (2003), net volume flux of a plume can be calculated by integrating the vertical flux through a plume cross-section, which can then be converted to heat and particle flux if coordinated with in-situ measurements of temperature and particle properties (concentration, size distribution, density). To achieve this, COVIS acquired acoustic data from a projector mounted on a tripod ~4 m above the seafloor at a fixed position. A computer controlled, 3- degrees-of-freedom (yaw, pitch, and roll), positioning system was used to point the sonar transducers providing a large coverage area at the site. Sonar data is collected at ranges of tens of meters from targets to make three types of measurements: 1) volume backscatter intensity from suspended particulate matter and temperature fluctuations in black smoker plumes which was used to reconstruct the size and shape of the buoyant portion of a plume; 2) Doppler phase shift which was used to obtain the flow rise velocity at various levels in a buoyant plume; 3) scintillation which was used to image the area of diffuse flow seeping from the seafloor. References. Bemis, K.G., Rona, P.A., Jackson, D.R., Jones, C., Mitsuzawa, K., Palmer, D., Silver, D., and Gudlavalletti, R., 2001, Time-averaged images and quantifications of seafloor hydrothermal plumes from acoustic imaging data: a case study at Grotto Vent, Endeavour Segment Seafloor Observatory, Abstract OS21B-0446 presented at American Geophysical Union, Fall Meeting 2001, San Francisco, CA, December. Jackson, D.R., Jones, C.D., Rona, P.A., and Bemis, K.G., 2003, A method for Doppler acoustic measurement of black smoker flow fields, Geochemistry Geophysics Geosystems (G3), v. 4, no. 11, p. 1095 (DOI: 10.1029/2003GC000509, 2003). Light, R., Miller, V., Rona, P., and Bemis, K., 2010, Acoustic Instrumentation for Imaging and Quantifying Hydrothermal Flow in the NEPTUNE Canada Regional Cabled Observatory at Main Endeavour Field (unpublished paper - URL: http://www.apl.washington.edu/projects/apl_presents/topics/covis/covis.php). Light, R., Miller, V., Jackson, D.R., Rona, P.A., and Bemis, K.G., 2011, Cabled observatory vent imaging sonar (abstract of presentation), Journal of the Acoustical Society of America, v. 129, no. 4, p. 2373. Merle, S. (compiler), 2006, NeMO 2006 Cruise Report, NOAA Vents Program, Axial Volcano and the Endeavour Segment, Juan de Fuca Ridge, R/V THOMPSON Cruise TN-199, August 22 - September 7, 2006. Seattle WA to Seattle WA; ROPOS dives R1008 - R1014 (URL: http://www.pmel.noaa.gov/vents/nemo2006/nemo06-crrpt-final.pdf). Rona, P.A., Bemis, K.G., Jackson, D.R., Jones, C.D., Mitsuzawa, K., Palmer, D.R., and Silver, D., 2001, Acoustic Imaging Time Series of Plume Behavior at Grotto Vent, Endeavour Observatory, Juan de Fuca Ridge, Abstract OS21B-0445 presented at American Geophysical Union, Fall Meeting 2001, San Francisco, CA, December. Rona, P.A., Jackson, D.J., Bemis, K.G., Jones, C.D., Mitsuzawa, K., Palmer, D.R., and Silver, D., 2003, A New Dimension in Investigation of Seafloor Hydrothermal Flows, Ridge 2000 Events, v. 1, no. 1, p. 26 (URL: http://ridge2000.bio.psu.edu). Rona, P.A., Bemis, K.G., Jones, C., Jackson, D. R., Mitsuzawa, K, and Palmer, D. R., 2010a, Partitioning Between Plume and Diffuse Flow at the Grotto Vent Cluster, Main Endeavour Vent Field, Juan de Fuca Ridge: Past and Present, Abstract OS21C-1519 presented at American Geophysical Union, Fall Meeting 2010, San Francisco, Calif., December. Rona, P., Light, R., Miller, V., Jackson, D., Bemis, K., Jones, C., and KenneyM., 2010b, Cabled Observatory Vent Imaging Sonar (COVIS) Connected to NEPTUNE Canada Cabled Observatory (poster abstract), 2010 R2K (Ridge 2000) Community Meeting, Portland, OR, 29-31 October 2010 (URL: http://ridge2000.marine-geo.org/community-meeting/october-2010/2010-r2k-community-meeting). Rona, P., 2011, Sonar images hydrothermal vents in seafloor observatory, EOS Transactions, American Geophysical Union, v. 92, no., 20, p. 169-170. Rona, P.A., Benis, K.G., Jones, C.D., and Jackson, D.R., 2011, Multibeam sonar observations of hydrothermal flows at the Main Endeavour Field (abstract of presentation), Journal of the Acoustical Society of America, v. 129, no. 4, p. 2373. Information Contacts: Peter Rona, Institute of Marine and Coastal Sciences and Department of Earth and Planetary Sciences, Rutgers University, New Brunswick, NJ; NEPTUNE Canada (URL: http://www.oceannetworks.ca/). The Global Volcanism Program has no Weekly Reports available for Endeavour Segment. At 1631 on 26 February 2005 (0031 UTC on 27 February), a hydroacoustic network detected the start of what became an intense earthquake swarm (Ridge 2000 TCS (Time Critical Studies) Oversight Committee, 2005). The source of the swarm was on the Endeavour segment of the northern Juan de Fuca Ridge (JdFR) (figure 1). Figure 1. Location map of the February 2005 earthquake swarm on the Juan de Fuca ridge along the Endeavour Segment. Courtesy Ridge 2000 TCS Oversight Committee, 2005. More than 3,740 earthquakes were detected over a 5.5-day period (figure 2). Event counts were as high as 50-70 per hour, which is similar in scale to event counts associated with sea-floor-spreading events on the ridge at both the Middle Valley segment in September 2001 and at the Endeavour segment in 1999. The hydroacoustic array is the Sound Surveillance System (SOSUS) of the National Oceanic and Atmospheric Administration (NOAA). Figure 2. Histogram showing the number of seismic events per hour on the Endeavour segment of the Juan de Fuca ridge. The x-axis extends over Julian days 56-64, 2005 (25 February-5 March 2005). Courtesy National Oceanic and Atmospheric Agency (NOAA) Vents web site, 2005. The preliminary location of the swarm's epicenters was 48°14.5'N, 128°57.6'W (figure 2), ~ 36 km NNE of the Main Endeavour vent field and a few kilometers E of the intersection of the Heck Seamounts with the JdFR axis. The sequence also produced three large earthquakes (mb 4.5, 4.8, and 4.9) detected by instruments of the National Earthquake Information Center (NEIC), the University of Washington, and the Pacific Northwest Seismograph Network (PNSN). The February-March 2005 seismic swarm also maintained an elevated, nearly constant rate of similar-magnitude earthquakes for several days, behavior consistent with magma intrusion and in contrast to the "mainshock-aftershock" sequence characteristic of tectonic events. Research response personnel were on station by 6 March, just six days after notification of the seismic swarm, a task that often requires a lead time of over a year. Results from the response cruise indicate that it is unlikely that the February-March 2005 earthquake swarm (figure 3) induced any corresponding expression at the sea floor (i.e., eruption of a lava flow) or in the water column (i.e., formation of new hydrothermal venting, either chronic or event plumes). Figure 3. Epicenters of the 305 larger earthquakes along the Endeavour Segment. Those indicated by the larger red dots were located using 4 or more hydrophones.The epicenters indicated by the smaller black dots were smaller events located using three hydrophones, and they may not be as well constrained. Epicenters are plotted through 1 March 2005 and comprise 305 events. Courtesy National Oceanic and Atmospheric Agency (NOAA) Vents web site, 2005. In-situ and shipboard physical and chemical data from the three long tow-yo casts and seven vertical casts revealed no water-column signal that can be clearly associated with the recent earthquake swarm, whether magmatic or tectonic. Initial calculations of methane to hydrogen ratios from the Main Endeavour Field, and from Mothra, High Rise, or Salty Dawg vent fields along the Endeavour segment are comparable to historical (2003) values from vent fluids. No evidence of any temperature or optical anomalies was seen in the near-bottom camera tow data (CTD or MAPR) overlying an axial magma chamber reflector, close to the region of the February/March swarm. Camera images of the sea floor revealed no fresh basalt; rather, the entire camera tow track documented lavas with moderate to heavy sediment cover. Finally, no bathymetric anomalies were detected as the cruise scientists searched for evidence of new lava flows in the earthquake area by comparing before and after high-resolution multibeam bathymetry data. The earthquake swarm was thus thought to reflect a magmatic intrusion that failed to generate measurable changes in the sea floor or an intrusive magmatic event that did not reach sufficiently shallow crustal depths to lead to extrusion (eruptive flows) or stimulate venting at new or existing vent fields as discernable via surface-ship sampling. References. Ridge 2000 TCS (Time Critical Studies) Oversight Committee, 2005, Recent detected events on the Juan de Fuca Ridge, Status report on time critical studies: Ridge 2000 Events, v. 3 (Spring 2005), p. 14-15. Davis, E.E., and Currie, R.G., 1993, Geophysical observations of the northern Juan de Fuca Ridge system: Lessons in sea-floor spreading: Canadian Journal of Earth Sciences, v. 30 (2), p. 278-300. Information Contacts: Pacific Marine Environmental Laboratory (PMEL), National Oceanic and Atmospheric Agency (NOAA), 7600 Sand Point Way NE, Building 3, Seattle, WA 98115-6349, and Hatfield Marine Science Center, 2115 SE Oregon State University Drive, Newport, OR 97365 (URL: https://www.pmel.noaa.gov/eoi/); Robert Dziak, NOAA PMEL, Hatfield Marine Science Center, 2115 SE Oregon State University Drive, Newport, OR 97365. The Endeavour Segment (or Ridge) lies near the northern end of the Juan de Fuca Ridge, west of the coast of Washington and SW of Vancouver Island. The northern end is offset to the east with respect to the West Valley Segment, which extends north to the triple junction with the Sovanco Fracture Zone and the Nootka Fault. The 90-km-long, NNE-SSW-trending segment lies at a depth of more than 2000 m and is the site of vigorous high-temperature hydrothermal vent systems that were first discovered by scientists in 1981. Five major vent fields that include sulfide chimneys and black smoker vents, first seen from the submersible vehicle Alvin in 1984, are spaced at about 2-km intervals in a 1-km-wide axial valley at the center of the ridge. Preliminary uranium-series dates of Holocene age were obtained on basaltic lava flows, and other younger "zero-age" flows were sampled. Seismic swarms were detected in 1991 and 2005. Delaney J R, Robigou V, McDuff R E, 1992. Geology of a vigorous hydrothermal system on the Endeavour segment, Juan de Fuca Ridge. J. Geophys. Res, 97: 19,663-19,682. Karsten J L, Hammond S R, Davis E E, Currie R G, 1986. Detailed geomorphology and neotectonics of the Endeavour Segment, Juan de Fuca Ridge: new results from Seabeam swath mapping. Geol Soc Amer Bull, 97: 213-221. There is no Deformation History data available for Endeavour Segment. There is no Emissions History data available for Endeavour Segment. 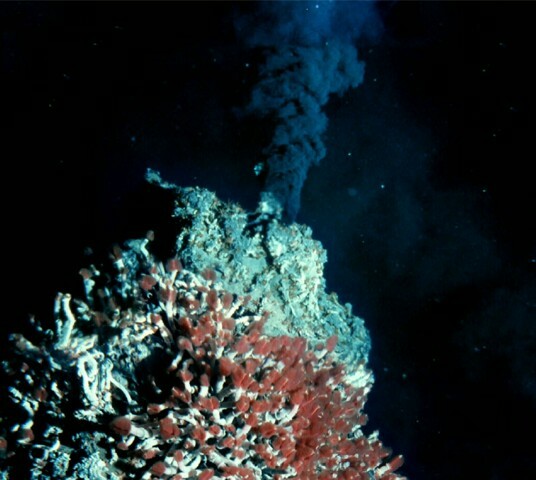 This 360° C black smoker chimney lies within the Main Endeavour hydrothermal field in the Endeavour Ridge segment at the northern end of the Juan de Fuca Ridge. Vibrant colonies of tube worms with red gills thrive on this large edifice, which is predominantly composed of iron- and sulfur-bearing minerals. The 90-km-long ridge segment, which lies west of the coast of Washington and SW of Vancouver Island, is the site of vigorous high-temperature hydrothermal vent systems that were first discovered by scientists in 1981. Image courtesy of NOAA Ocean Explorer and University of Washington. There are no samples for Endeavour Segment in the Smithsonian's NMNH Department of Mineral Sciences Rock and Ore collection. IRIS seismic stations/networks Incorporated Research Institutions for Seismology (IRIS) Data Services map showing the location of seismic stations from all available networks (permanent or temporary) within a radius of 0.18° (about 20 km at mid-latitudes) from the given location of Endeavour Segment. Users can customize a variety of filters and options in the left panel. Note that if there are no stations are known the map will default to show the entire world with a "No data matched request" error notice. Large Eruptions of Endeavour Segment Information about large Quaternary eruptions (VEI >= 4) is cataloged in the Large Magnitude Explosive Volcanic Eruptions (LaMEVE) database of the Volcano Global Risk Identification and Analysis Project (VOGRIPA).